Congratulations, you survived the first half of the semester. It’s only normal for you to want to sit back, grab your favorite snack and binge watch Netflix. And I encourage you to do so, just not all week. Otherwise you’ll end up feeling like the Sunday night after Thanksgiving break. Yes, spring breaking can be difficult, especially if you’re short on cash, yet there’s plenty of single-day activities that won’t break your piggybank. So grab the people in your life that don’t annoy you too much and split the cost for these fun-filled day trips that will have you simultaneously living your best life and being cautious of wildlife. If you’ve taken geology you know what a granite pluton batholith is. If you haven’t, or if you just weren’t paying attention, don’t worry. It’s just a beautiful, fairly large chunk of granite that is peeking up from Earth’s crust. 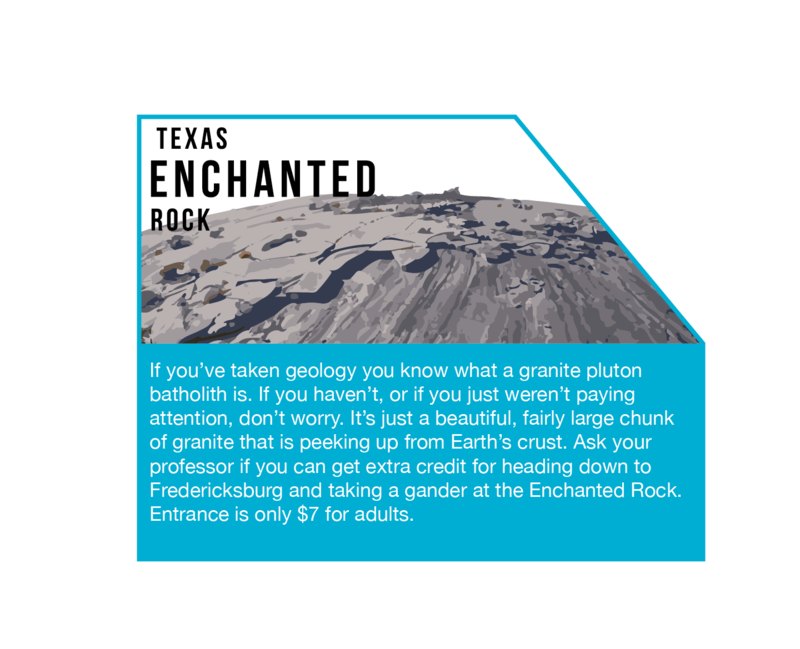 Ask your professor if you can get extra credit for heading down to Fredericksburg and taking a gander at the Enchanted Rock. Entrance is only $7 for adults. The HOPE Outdoor Gallery in Austin is a pretty basic outing, yes. But, and it’s a big but, its closing down soon. So, I encourage you, if you haven’t already, to grab your pals, some spray paint, and create a masterpiece on top of the layers and layers of art on the concrete walls. Then when you’re hungry drive down the street to Wingzup for some wings, burgers, nachos and so many more delicious dishes. Texas is filled with scenic areas. I suggest you venture out to another one of Texas’ state parks. Be sure to have your playlist ready for this 3-and-a-half-hour drive down to Colorado Bend State Park. Bust out your favorite swimsuit so that you can enjoy the beautiful springs that are available to swim in, but mostly to capture the perfect Instagram photo with the sun’s rays shining on you. Entrance is $5 for adults. Bring out your inner Noah Jr. and Allie Hamilton and head out to Caddo Lake State Park near the Louisiana-Texas border to take a canoe ride through the swamp-like lake. But if you’re not a fan of water, feel free to take a hike on one of the park trails for a canoe ride through the swamp like trees. It’s only a 3-and-a-half-hour drive, that’s approximately 55 of your favorite songs. The best part? Entrance is only $4 per person and canoeing cost $10 an hour for two people. Watch out for the alligators, though. Take an hour drive to the Galaxy Drive-In Theatre. Be sure to get there early to get a good spot. Don’t worry if the sun is still out, you can walk over to their mini-golf section or beat the crowds and buy your food before the movie starts. Enjoy a double-feature for only $7.00 a person or, for kids 12 and under, $3. Spend your morning watching cartoons and eating cereal. Later, invite some friends over to play some board games, social sabotage is highly recommended if you want to embarrass your friends, or yourself more than you usually do.